OMRON, the global leader in technology designed to solve social issues, returns to the Consumer Electronics Show (CES) this year with the largest, most advanced interactive exhibit of artificial intelligence (AI), robotics and automation at the annual event. At CES 2019, OMRON is showcasing the harmony between humans and machines with its celebrated AI-equipped robotic table tennis tutor and debuting its Factory Harmony experience in which visitors work collaboratively with advanced machines in a vision of the manufacturing environment of the near-future. "OMRON's founding principle is to improve lives and contribute to a better society. We believe that technology can serve that goal and that's what we are demonstrating here at CES," said Nigel Blakeway, managing executive officer of OMRON Corporation. "At our CES 2019 booth, attendees are interacting directly with OMRON AI, robotics and automation and experiencing the harmony that can be achieved between humans and machines when technology is designed to unleash and augment human potential." OMRON's AI-equipped table tennis tutor, FORPHEUS, is an interactive representation of the company's integrated technologies with OMRON Sensing & Control + Think at the core of the demonstration. FORPHEUS illustrates how intelligent machines can learn from human interaction and help develop and support human potential. Rather than competing, FORPHEUS learns from and tutors each player, adjusting his abilities to promote longer rallies, coaching and encouraging the other participant throughout their match. At CES 2019, OMRON is presenting the fifth-generation FORPHEUS, upgraded with advanced capabilities to learn from and coach the player, an expanded range of movement, faster ball return skills, enhanced people and ball-sensing prediction and deeper AI-powered personalized coaching. FORPHEUS now features "elbow" and "wrist" movements to place topspin and backspin on the ball. OMRON developers sharpened his vision, which now boasts high-speed image processing by a stereo camera. Using his improved perception and data from a player's performance, FORPHEUS now compares a player's form and skill to that of a professional table tennis player, providing personalized coaching. "Many CES attendees voice that FORPHEUS is a fun and fascinating example of the harmony between humans and machines. Everyone wants to watch and play him, but only a few are able to receive a tutoring lesson," said Blakeway. "FORPHEUS is an excellent ambassador for the harmonious relationship between humans and machines and a strong demonstration of the dynamic AI and robotics technologies that are evolving the modern workplace." OMRON's Factory Harmony exhibit at CES 2019 is demonstrating the manufacturing floor of the near-future, with machines that work to understand and help humans. Those who visit the OMRON booth can work in collaboration with machines and be part of an interactive product manufacturing demonstration, creating their own personalized product. In the Factory Harmony exhibit, OMRON pick and place automation demonstrates the potential for machines to manage fine detail work with speed and accuracy. 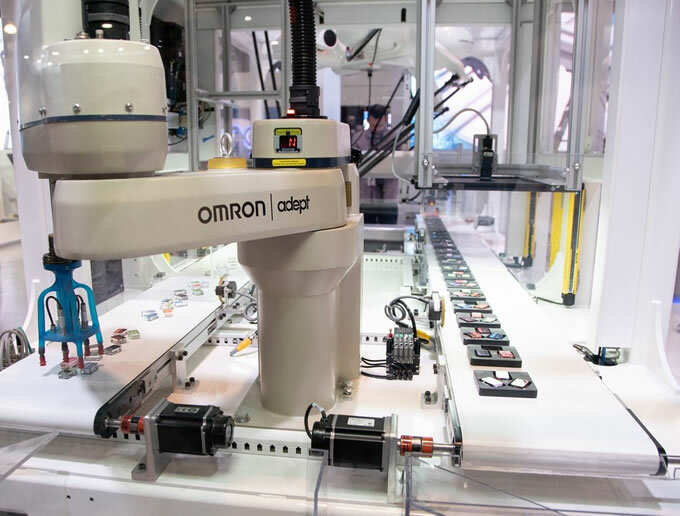 Meanwhile, OMRON mobile robots create flexibility in the manufacturing line, demonstrating the ability to meet growing demands for product transfer customization without reconfiguring an entire equipment line. OMRON mobile robots and collaborative robots work safely side-by-side with humans, adapting to worker needs and environmental conditions for a safer workplace. "Our Factory Harmony exhibit demonstrates how humans and machines can work together to meet the demands of modern manufacturing, including flexibility and customization, traceability of products and a higher standard of worker safety," said Deron Jackson, chief technical officer of OMRON Adept Technologies. "Our vision of Factory Harmony is humans and machines working together to ensure constant improvements in productivity, efficiency, product quality and a more rewarding worker experience." On day one of CES (Tuesday, January 8), OMRON is hosting two complimentary Tech Talks delivered by experts in AI, robotics and automation in their booth (#26002) in the Las Vegas Convention Center South Hall 2. The Tech Talks (noon to 12:15 p.m. PST and 4 to 4:15pm PST), feature Jason Wilmot of mediaX at Stanford University and Deron Jackson, chief technical officer of OMRON Adept Technologies, addressing the "Future Relationship Between Humans and Machines." The Tech Talks are a presentation of the OMRON SINIC X Corporation, a research company founded in Tokyo by OMRON to design the near future. The company will pursue open innovation through collaboration with universities and external research institutions to expedite the creation of "near-future designs." "OMRON has worked for decades to contribute to significant strides in technology that contributes to people's lives. It's very likely CES attendees have interacted with our technologies like our facial recognition image sensing, which is in more than 500 million devices worldwide," said Blakeway. "We're looking forward to connecting with new partners and talent at CES, showing them what OMRON is about and discussing upcoming projects and expansion in the U.S. and around the world." OMRON Corporation is a global leader in the field of automation based on its core technology of "Sensing & Control + Think." Established in 1933, OMRON has about 36,000 employees worldwide, working to provide products and services in 117 countries. The company's business fields cover a broad spectrum, ranging from industrial automation and electronic components to automotive electronics, social infrastructure systems, healthcare and environmental solutions. For more information, visit OMRON's website: http://www.OMRON.com/.